When it comes to price models for Purchase to Pay solutions, there are as many as there are providers. Some charge per transaction either as a flat fee or as a percentage of the value of the transaction. Some charge suppliers, some don’t and some charge an annual fee per user. There are upfront project fees and implementation costs and all of these have to be collectively considered in order to assess the cost element when selecting a P2P solution. There is no best model. Each has its own merits and shortcomings but what are those merits and shortcomings and how should they compared? You could take a very simple view. Ignore the price model and instead, just look at the total costs regardless of how it is calculated. A cost is a cost. But this is way too simplistic. Take an enterprise wide license that allows a business to give access to a system to as many users as they wish. That’s a useful price model because it means there are no barriers to increased usage and costs are fixed and predictable. But it’s only useful if the software is actually used. This is an attractive model if you assume that the software will be implemented successfully and adopted widely but that is not necessarily a safe assumption. The total cost are of course of central importance but the shape of the fees and their appropriateness is also important. Among the fee models there are those that require payment from the buyer, those that require payment from the supplier and those that require payment from both. There are fixed transaction fees and the transaction fees based on the value of the transaction. This last model is perhaps the most problematic. I’ve written about the value based transaction fee model before (Ariba’s supplier fee model and the killer anomalies). It’s not the scale of the charge that is the issue, rather, it’s the principle and in particular the anomalies it produces. 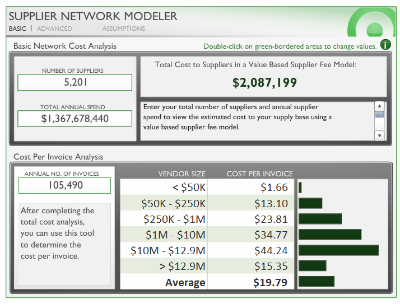 Take Ariba’s supplier fees as an example. The percentage charged to suppliers is tiny – and the total fees payable is capped. At first glance this appears to be reasonable or even moderate but there are cases that just don’t make sense. Take for example and invoice for $500,000. A transaction fee of just one tenth of one percent would be $500. That’s a $500 fee for sending an invoice. It makes no sense. The fixed transaction fee model is the simplest and, in my opinion the most attractive price model. The costs are related to actual usage which reflects value being added but they also relate directly to the service provided. The value a P2P solution adds is in proportion to the volume of transaction – not the value. It therefore makes sense to charge on this basis. This is the model used by several vendors including Perfect Commerce, Tungsten and Basware. There is one more dimension to the price model that is important: who pays? Either the buyer pays, the supplier pays or they both pay. Tradeshift can take some credit for popularising, with their marketing, the free to supplier price model as far as e-invoicing is concerned when they launched their e-invoicing service in 2010 although they weren’t actually the first. 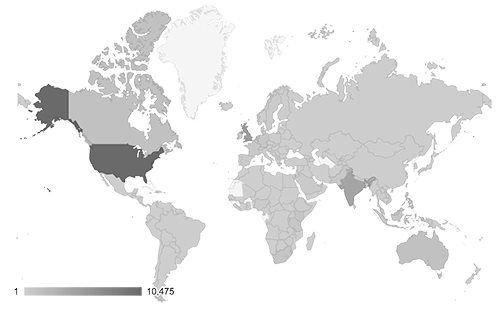 Coupa for example introduced their free supplier network two years earlier. Free to supplier is a powerful message. If most of the value added from P2P is delivered to the buyers, why should the supplier pay? Is it not enough to ask suppliers to do things in the way the buyer would like including adopting a new technology? And in a world where email is free, where’s the logic in charging to send an invoice over the internet? The free to supplier message seems compelling, but like most things, it’s not that simple. As one senior procurement person said to me recently “free to suppliers just means we pay”. There’s no such thing as free. The supplier still has to perform some sort of implementation and maintenance of a system and possibly of many systems as more customers demand that they use one flavour or another of P2P. And besides, the suppliers do derive some value so a cost to them is justified. Regardless of which side of the fence you sit on the free to supplier debate, there is one thing that is certain – suppliers don’t like to be charged – even a small amount. In a world where collaboration is valued and celebrated, asking suppliers to pay for a buyer’s business initiative is just not right. And it’s lazy. 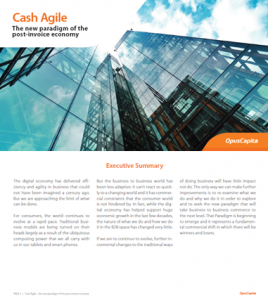 Getting suppliers to pay means there’s no need for a robust business case. If your e-invoicing programme fails, it doesn’t matter because it isn’t costing you anything. The fact is, if it’s worth doing it’s worth paying for and if you can’t make that business case stack up you should question whether to proceed or not rather than simply transferring the risk to suppliers. When selecting a Purchase to pay solution, price is important but so is the price model. If your operating model is sound, a good P2P solution will deliver efficiencies and reduce risk with every transaction. The more it is used, the greater the benefit so the price model should in no way deter users – buyers or suppliers – from adopting the technology. Consider your strategy on asking suppliers to share cost and which costs to expect them to incur. Examine how the charging model will impact your business and examine anomalies to see if they are likely to be significant. And one final point – choose your battles. When negotiating with a P2P vendor, you are much more likely to get them to flex their prices than you are to get them to change their model. Nice overview of pricing models, Pete. And wise advice at the end. Pete, great piece and thanks for the Tradeshift shift mention. I unsurprisingly disagree quite strongly with your senior procurement person quoting “free to suppliers just means we pay”. Why? What is the evidence of that. It’s not rooted in cost, it quite clearly don’t cost Ariba $500 to send one invoice, or even $1. Secondly I have never seen a single deal where we were able to charge more than those who ALSO charge suppliers with the argument that we need the supplier cost covered, ie. if you are not competitive on the buyer side you don’t win the deal. Finally I think he ignores the most important point, which is the 20 years or history proving that if you force the supplier to pay it hurts the on-boarding rates significantly and thereby destroys the overall business case for the buyer. I think an even more important question is what is the value to suppliers? If you solely look at B2B commerce networks as cost reduction you of course also tend to analyze their value through the cost lens, but the problem is that the real cost for suppliers as you point out is integration and change of behavior, if that “network” I just connected to is really just a portal and can only be used with one buyer, is limited in functionality and don’t enable basic services then the cost for the supplier is much bigger in process cost than just the network fees. With Tradeshift suppliers get rich accounts with ability to do business with all their customers, not just one, ability to manage product information, discover new buyers and tax compliance all as part of the free package. Higher value for suppliers means higher adoption rates which means a better business case for the customer. And no this don’t mean the buyer has to pay. There are just some of us that are a little better at building competitive cloud solutions where you as a buyer don’t have to pay for my legacy stack. Is trying to offer an “Amazon” style experience in e-procurement a good idea? e-procurement – Does mobile approval undermine control?